When designing your tiny house on wheels, it’s important to choose the right windows for light, ventilation and protecting your house from all types of weather. The way the window opens has a massive impact on its usefulness, not just where it is placed or the size of the window. In this blog we examine seven types of windows, listing their benefits and challenges to help you design your tiny home so that it ventilates air and moisture; lets in precious light and looks beautiful. We will also discuss the pros and cons of using wooden, aluminum and vinyl window frames, as well as which glass types to choose for safe transport of your tiny home on wheels. Awning windows hinge at the top of the window frame and open out at the bottom of the frame. Awning window let in lots of light, which is great for helping small spaces feel big and airy. They are less expensive than other window types. Rain doesn’t gather on the top of the window frame. Rain can cause a wooden frame to rot over time. Awning windows provide very little air flow for your micro house, unless they are placed high on the wall like in your loft. When awning windows are open, they protrude outside. If they are placed at head height, it may be an obstacle when walking around the outside of your tiny house. Double hung (double sash) windows are made from two separate window sections or sashes that move up and down past one another in the window frame. 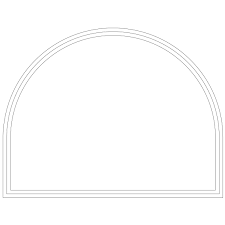 The two sashes can move in unison (bottom sash goes up as the top sash moves down) or they can move independently depending the type of sash mechanism. Avoid “single sash windows” with a fixed top sash because these obstruct the flow of hot air moving out. Double hung windows create great air-flow because they open at the top of the frame. This is especially important for ventilating tiny spaces of hot air and moisture. So these windows are a good choice for inside bathrooms or up high at the very apex of your ceiling pitch. As both sashes need to move, double hung windows can take longer to make so they can be more expensive than other window designs. The external fly screen needs to be removed from outside to clean the window which is tricky when the window is high up (like in the loft of your tiny house). It’s safest to remove external fly screens from windows during transport of your tiny home on wheels because they might come loose from road vibration and wind force. 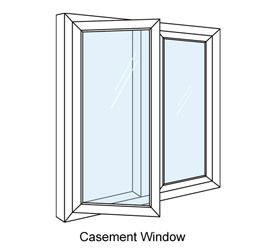 Common casement windows are hinged on one side of the window frame. Common casement windows are relatively inexpensive as they are easy to make. Good air flow from one direction, which means that if the wind is blowing from the correct angle, the open window will funnel that air inside. 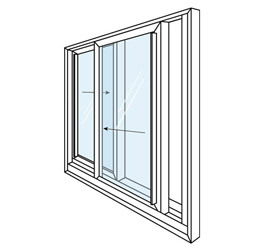 Common casement windows are not good for air flow if the wind is coming from the wrong direction. For long life, wooden-framed casement windows should be protected from the rain when open. This rain cover could be created by an awning or an extended roof line on the short wall of your tiny home. If the casement window is not protected from the rain, water can accumulate on the top of the frame and over time rot the wood. Safety catches are recommended to create a secure seal when the window is shut, which is especially useful in winter. An open casement window can create an obstacle outside when open. Center pivot windows are “hinged” in the center of the frame. The window pivots allowing the window to sit perpendicular to the frame. An open center pivot window creates an opening on both sides of the vertically-hung glass. Center pivot windows provide the best airflow for a tiny house. Even small windows can allow for great ventilation when this window style is used. This is because the open window funnels wind from either direction in your tiny house. The top of the center pivot window needs to be protected under an awning (see ‘Challenges’ section in common casement windows). 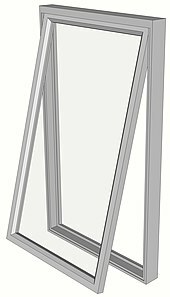 Slider windows are made of two (usually equally sized) panes of glass. One is fixed and the other moves across it to open. Slider windows can be made very small, making it great for tiny spaces in your micro home. Locating a frosted slider window in your shower stall can let out moist air from your shower passively without having to use an mechanized extraction fan. 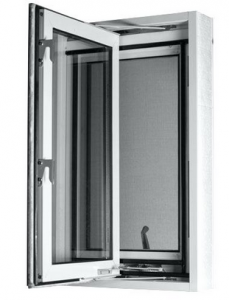 Often only half the window opens in a slider window, limiting its capacity for ventilation. Slides can collect dirt grime with use which can be tricky to clean. Louvre windows are made from many slats of glass that are stacked vertically that all open and shut in unison with one lever. Can be effective at passively removing warm or moist air rising. Good for long, narrow window placement. Glass and lever can protrude into the room, which requires careful placement so it doesn’t inhibit your use of the space. Provides less light and little view (especially if frosted for bathroom use). Louvre windows contain lots of moving parts which could break. Fly screen is located on the exterior. Not well suited for wide window spaces or for areas where heavy things could fall on them. Fixed windows do not open at all. Fixed windows are the least expensive windows available. 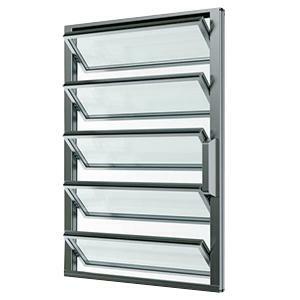 Well suited to feature windows displaying unconventional shapes or coloured glass. No air leakage because you’re not reliant on seals. Don’t open and therefore provide no ventilation. Vibration resistant, therefore safe for transporting your tiny house. Vinyl plastic can be less UV resistant than other materials and therefore become brittle under Australian sun. Vinyl is susceptible to scratching and is not repairable. Wooden frames are natural and can smell great. Certain woods can be lightweight (See Fred’s density chart to indicate weights for different materials). Wooden window frames are repairable. Architraves are easy to finish. Different woods can be heavy. Wooden window frames are bulkier than aluminum, therefore taking up space in the rough opening, decreasing the space for the window pane. Wood is best treated with occasional coats of oil or paint which amounts to maintenance. Wood will expand and contract with seasonal temperature differences. Aluminum frames are one of the least expensive window framing options. Slim-line, allowing for the maximum amount of window pane to be used in the rough opening. Aluminum window frames require a high levels of energy in their fabrication. Aluminum has thermal properties of conducting heat (acting as a ‘thermal bridge’) which means it will contribute to transferring outdoor temperatures inside your tiny house. What are called, “Thermally broken aluminium” windows can counteract this tendancy. Architraves and flashing can be tricky to install. Aluminum frames will show any scratches or damage easily. When choosing the type of glass to use for your windows, there are a few difference from choosing windows in a conventional house. Double-glazed (or double-paned) windows in a tiny house? No thanks! Double-glazed windows do not provide effective insulation against heat entering the house in summer. Only a radiant barrier does that, which is why we offer fold-away awnings as a standard on all our tiny house designs. Putting a shade covering over a large window is a great way of keeping radiant heat from the sun out of your micro house. We are also concerned with weight limitations to make your tiny house on wheels safe to tow. Double-glazing your windows may just add unnecessary weight to your tiny house vehicle. Caveat: Of course all tiny houses are different and respond to different needs. If you are designing a tiny house in a cold climate like in Tasmania and you have a massive plate-glass feature window, then yes, you might benefit from the insinuative properties of a double-glazed window. As tiny homes on wheels are vehicles and need to be safe to tow, an important aspect of window choice comes down to what happens in the event that they break. The glass is subject to road vibrations (which is like a really long earthquake for your tiny house) so it is best to both plan for breakage and work to avoid breakage. Laminated glass is another type of safety glass, often used to make car windscreens. It is made from two separate glass panes bound together by an internal layer of plastic. 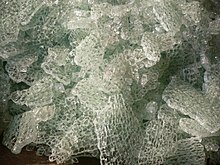 The layer of plastic helps the glass to remain intact even when broken. While laminated glass is a good option for safety, it is thicker than laminated glass and will therefore add to your house’s total weight. The thinnest available laminated glass option in Australia is 6.38mms because it is constructed of two panes of three millimeter glass joined with a 0.38mm layer of plastic. The laminated glass standard in the USA and elsewhere is 5.38mms thick. To find out things that you never even considered before about tiny house design, building and regulations, attend Fred’s Tiny Houses workshops. They are a powerhouse of information and are offered in nine different locations around Australia. See you there! We hope you found this blog useful. If you’d like to receive all our future blog posts straight into your inbox, subscribe here. Please feel free to share this blog around, comment and let us know if we can help you with your tiny house building project. Choose the right windows for your tiny house on wheels by Shannon Schultz is licensed under a Creative Commons Attribution-NonCommercial 4.0 International License.